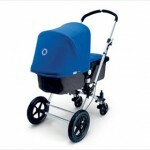 1) For safety reasons we recommend buying a 4 wheel bassinet stroller rather than a 3 wheeler. This will give you more control and balance, and is better for turning sharp corners. 2) Stay away from the color black. Black absorbs sunlight and can cause a hot to the touch bassinet for your baby. If you live in sunny California or somewhere the sun shines bright most of the year then go with any color besides black. 3) The padding in a bassinet stroller is very important. The bottom line is to make sure there is plenty of padding, so if you accidently stroll over a bump too hard your baby will have enough padding to absorb the impact. The most important padding is where the baby’s head rest. 4) Covering. 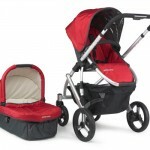 Make sure to buy a bassinet stroller with a good overhang covering to keep out the direct sunli ght on the babies eyes. Buy a large covering to keep out the rain or random debris falling. 5) Some of the nicer bassinets strollers are detachable. This is where you can take the bassinet out of the stroller. This is great if you want to stop in to get something to eat, drop off mail, say hi to a friend, etc., and want to take your baby indoors in just the bassinet. 6) Accessory holders. Look for strollers that have places or pockets to put bottle milk, water, snacks, extra blanket, etc. The last thing you want to do is have to carry these accessory items. Now that you have a little more knowledge on what to look for when buying bassinet strollers we hope you enjoy your new bassinet stroller. We do know babies really enjoy going for strolls outside. Remember for your newborn baby the outdoors, sky, and sun are all brand new sensations to their curious eyes. This entry was posted on Tuesday, April 14th, 2009 at 8:53 pm	and is filed under Bassinet Guides. You can follow any responses to this entry through the RSS 2.0 feed. You can leave a response, or trackback from your own site.